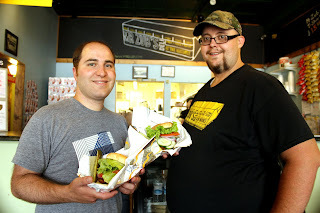 Akron Film+Pixel Festival co-director Rob Lucas (left) and Mr. Zub's chef, Micah Townsend (right), present the Akron Film Burger. Photo by Steve Felix. Mr. Zub’s chef Micah Townsend loves movies. In fact, every dish in his restaurant is named after a film or film character. 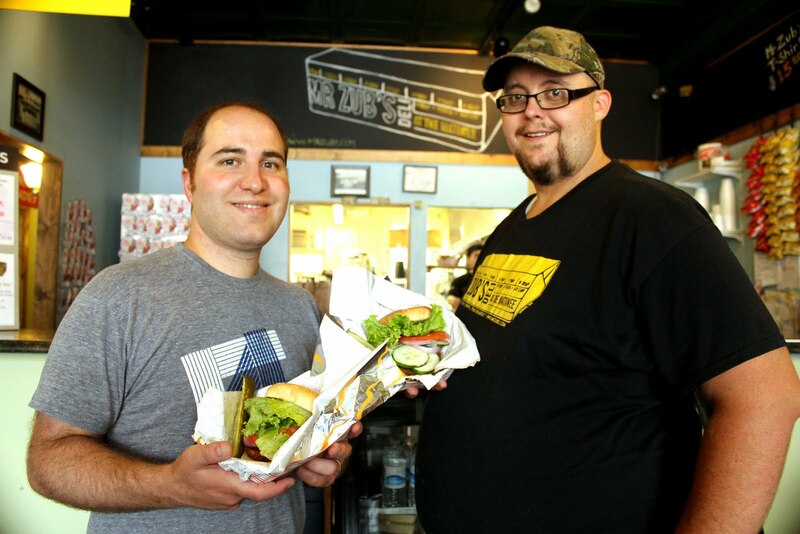 Starting on August 22 his newest creation, The Akron Film Burger, will be available to the public. The sandwich is in honor of the 2011 Akron Film+Pixel Festival (formerly the Akron Film Festival), which will take place at the Akron Art Museum (1 South High St., Akron, OH) October 6-9, 2011. The Akron Film Burger is a vegan spicy black bean burger, made to order with a wide variety of different toppings. It will join the Mr. Zub’s menu for a limited time among the ranks of The Kid (Film: Bad Santa; deep fried jalapeno cheese ravioli stacker), The Thurgood Jenkins (Film: Half Baked; tater tots, sour cream, chives, nacho cheese and bacon) and The Dirk Diggler (Film: Boogie Nights; a giant hot dog with onions, slaw, mustard and chili). The Akron Film Burger is $6.99 and will only be available from August 22-October 10, 2011. The full list of Akron Film+Pixel Festival films, panels and parties will be available on September 3, 2011 at www.akronfilm.com. Festival passes are on sale now. Mr. Zub’s is located at 812 W Market St., Akron, OH. Their full menu can be found at www.mrzubs.com. For more information please contact festival co-director Rob Lucas at (330) 618-4405 or co-director Steve Felix at (330) 603-1520, or email info@akronfilm.com.